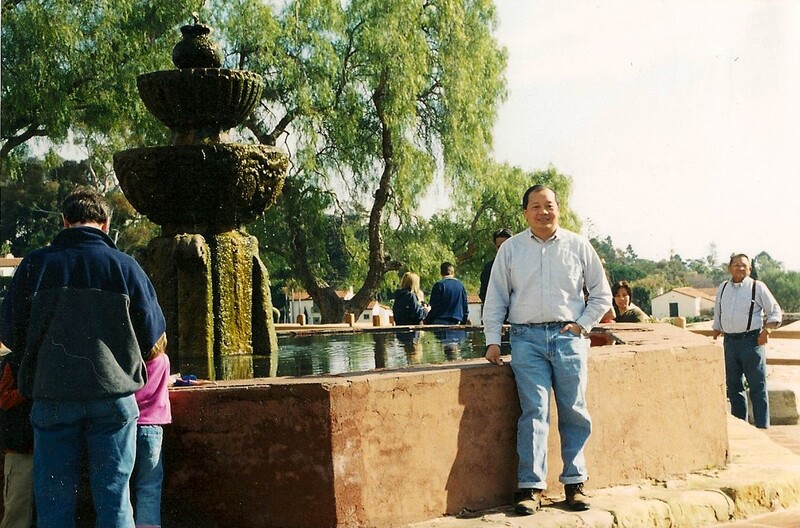 1/14/01 Gil, posing next to a fountain at the Mission. 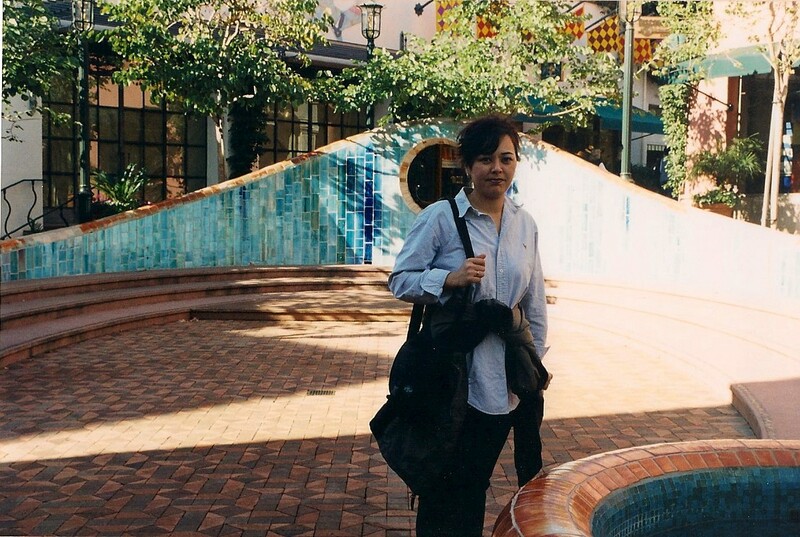 1/13/01 The day before, Gil next to a water feature on State Street in Santa Barbara. 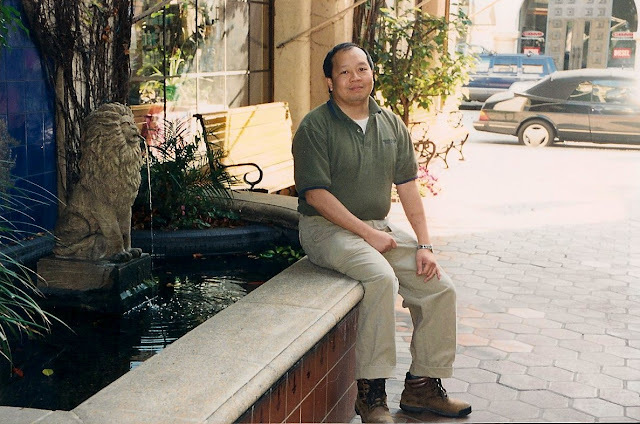 1/13/01 Here's moi on Paso Nuevo, off the main drag in Santa Barbara, looking slightly frazzled. 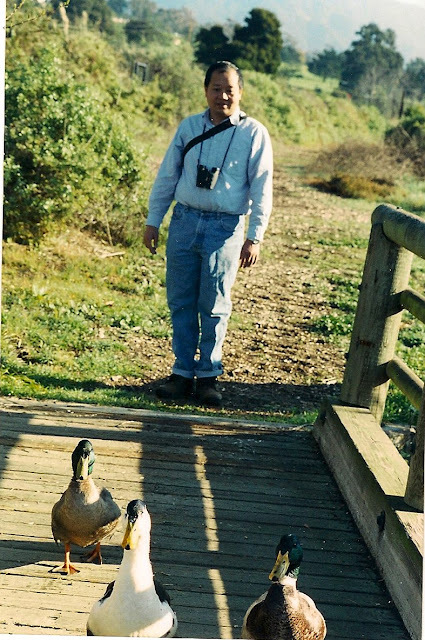 1/14/01 Gil, trailing some Mallard ducks & their hybrids along a boardwalk at the Andree Clark Bird Refuge (1400 E. Cabrillo), Santa Barbara. That smirky smirk just tells me he's thinking "Duck a la' orange or foie gras." In my mind, they all look like potential pets with names like Mabel, Hank, or Daisy Mae. 1/14/01 Brown Pelican (Pelecanus occidentalis), Andree Clark Bird Refuge, Santa Barbara. 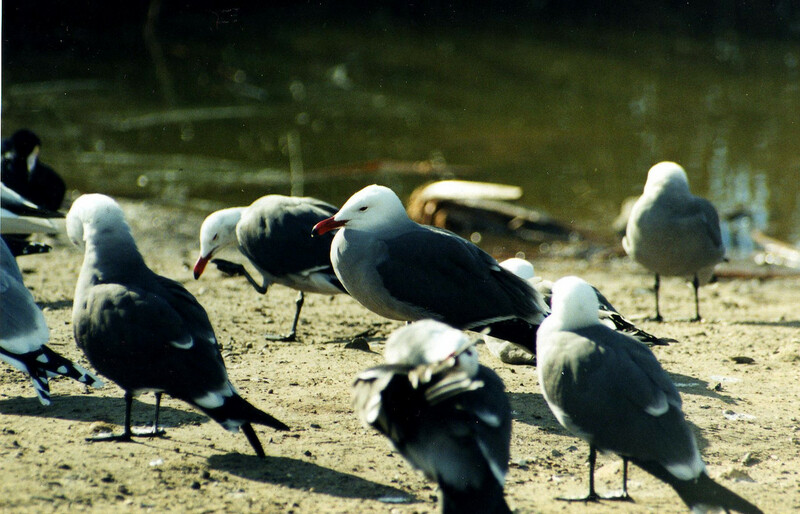 1/14/01 Heermann's Gulls (Larus heermanni). 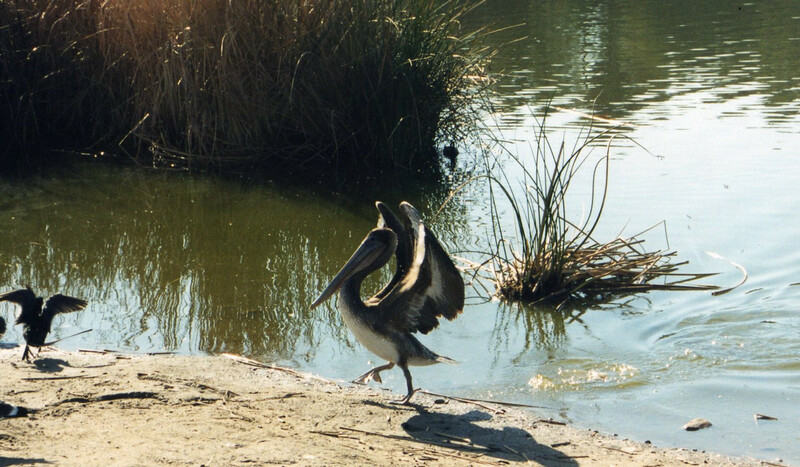 Andree Clark Bird Refuge, Santa Barbara. 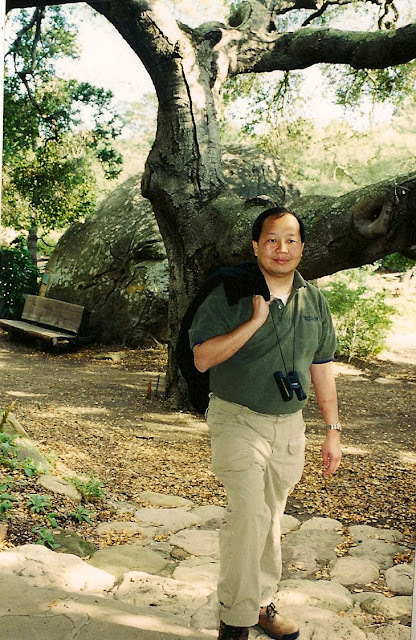 1/13/01 Gil in front of a Coast Live Oak (Quercus agrifolia). Santa Barbara Botanic Garden. 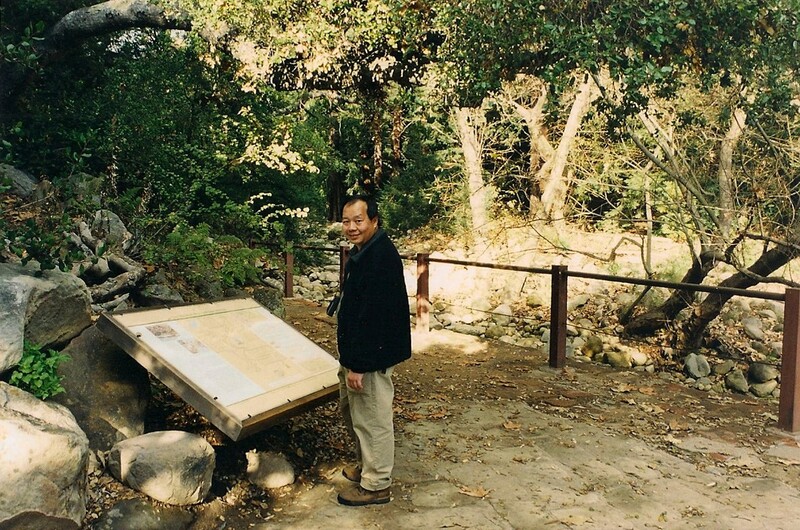 1/13/01 Mission Dam, Santa Barbara Botanic Garden. Well, enough of all this reminiscing...we're heading out to Northridge tomorrow (half way point between Murrieta and Camarillo) to have Dim Sum with Gil's parents, so our plan is to stop by the Mission San Fernando Rey on the way back. If we actually do, then I'll be be posting more mission pix tomorrow. 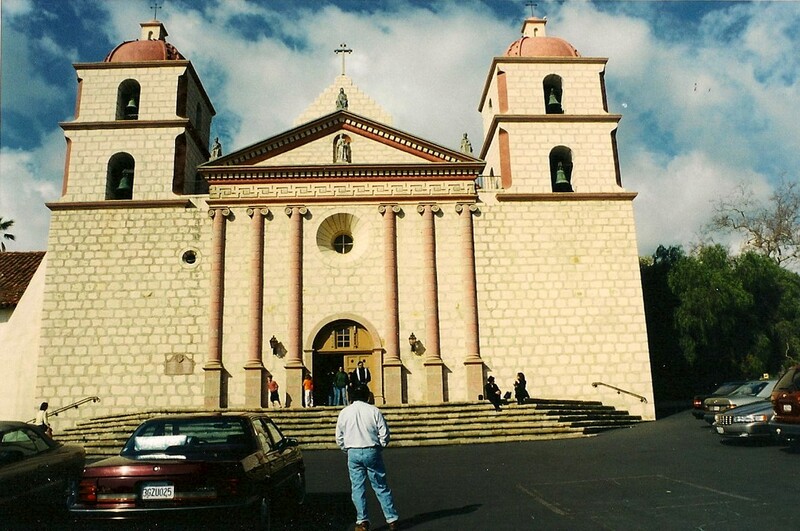 We also plan on revisiting the Santa Barbara Mission again so I can take a lot more than just four pictures. Stay tuned. Hours: 9am-5pm daily. Closed Easter Sunday, Thanksgiving, Christmas Day. Admission Fees: $5 adults, $4 seniors, $1 ages 5-15, free for children under age 4. 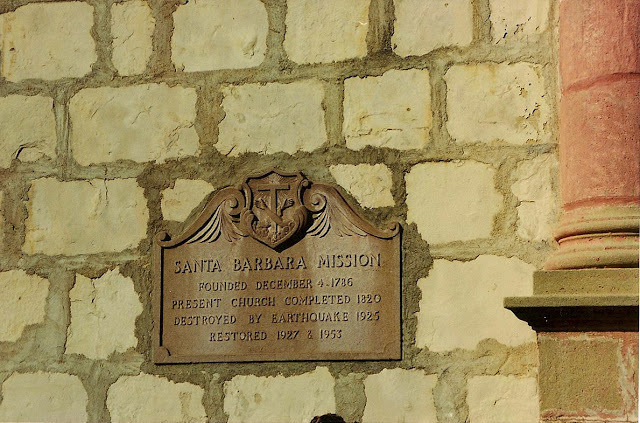 Santa Barbara is the 10th of 21 California Missions. Indians Joining this Mission: Santa Barbara was the 3rd mission established in the land of the Chumash people at the native site of Xana'yan. The neophytes were referred to as Barbereno (after the mission) and Canaleno. Mission Site: In the city of Santa Barbara on a hill commanding a striking view of the sea. Layout: Santa Barbara was laid out in the traditional quadrangle, with separate granaries, a weavery with patio, tannery, and neophyte housing forming additional courtyard-oriented squares. many of the existing buildings at the rear of the mission complex, however, were created to meet the needs of the seminary, established in the 20th century. Most of the new construction follows the foundations of the old quadrangle. Water Source: Water was channeled from a dam constructed in Pedragoso Creek, high above the mission. A two-mile long stone aqueduct carried water to a storage reservoir, feeder reservoir and settling tank constructed in 1806 and attributed to Indian mason Miguel Blanco de Baja California. A second aqueduct carried drinking water to the mission, its fountains and Lavanderia washing facilities. Population: The highest population recorded was 1,792 in 1803. Livestock: Santa Barbara had a sizeable livestock herd that exceeded 10,000 head in the years 1802-1823. In the peak year of 1821 the mission had 13,732 animals including 3,500 cattle and 9,000 sheep. Agricultural Output:Over the years 1787-1834 Santa Barbara reported harvesting 223,285 bushels of wheat, barley, corn, beans, peas, lentils, garbanzos and habas (broad beans). The mission had two vineyards and many fruit trees. Mission Church: The church was completed in 1820 with one tower. The second tower was added in 1831, collapsed within 2 years, and was rebuilt in 1833. The Neoclassic facade was inspired by a mission archives copy of the Spanish edition of The Six Books of Architecture by Marcus Vitruvius Pollio, a Roman architect of the 1st century B.C. Mission Bells: Six bells hang within the two church towers. Mission Art: The mission church is filled with original and noteworthy paintings and statues, including a unique abalone-encrusted Chumash altar dated to the 1790s. The two largest religious paintings in all of the missions are at Santa Barbara. One painting, 168" high by 103" wide, depicts the "Assumption and Coronation of the Virgin." It is thought to have originated in the Mexico City studio of Miguel Mateo Maldonado y Cabrera (1695-1768) and was acquired by the mission in 1798. "The Crucifixion" (168" x 126") is not attributed to a specific artist. Special Attraction: The beautiful Moorish fountain located in the front of the monastery wing, to the left of the church, was sculpted by mason and carpenter Jose Antonio Ramirez in 1808. Significant Events: Neophytes revolted at Santa Ines, Santa Barbara and La Purisima in 1824. The event underscored how relations with the largely Chumash neophytes deteriorated after the Mexican takeover of California in 1821. Interesting Facts: Under Fr. Narciso Duran the mission became the major record depository for the mission chain, a role that continues to this day. Francisco Garcia Diego y Moreno, the first Catholic Bishop of California, resided at this mission from 1842 to 1846. 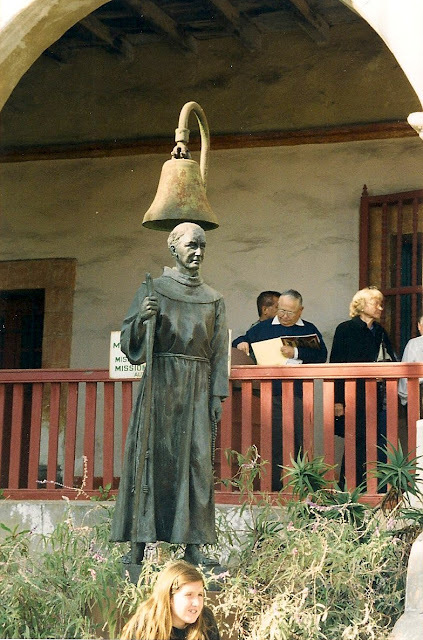 Santa Barbara is the only mission continuously operated by the Franciscans since its founding. An Apostolic College or missionary center for California functioned at the mission from 1856 to 1885, a Junior Franciscan Seminary from 1886 to 1901, and St. Anthony's Seminary from 1900 to 1987. Juana Maria, the Lone Woman of San Nicholas Island portrayed in Scott O'Dell's Island of the Blue Dolphins was buried in the mission cemetery in 1853.